Daniel Dorff's music, we learn in the liner notes, has been commissioned by the Philadelphia Orchestra's education department as well as by the Minnesota Orchestra's Kinder Konzert series. His music has also been performed by the symphony orchestras of Baltimore, Pittsburgh, Louisville, Detroit, St. Louis, and Oregon. With his strong affiliation with Philly's and Minnesota's youth series, one might expect the music to be rather kiddie-like, but such is not the case. It is, most certainly, cheerful and appealing music, but unlike some modern composers writing in a tonal style, Dorff manages to maintain his compositional dignity. His music is full of unexpected harmonic and rhythmic twists and turns, it fully engages the intellect, yet it is also thoroughly enjoyable music. Would that all composers wrote thus! 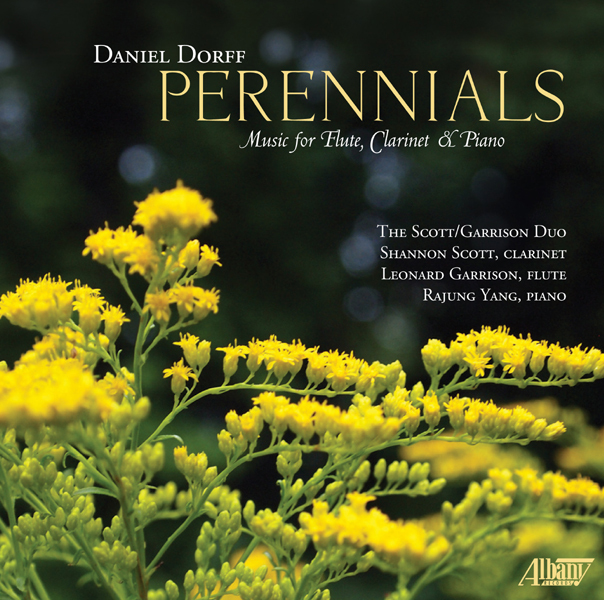 A perfect example of where Dorff is at, musically, is the scherzo of Perennials. Though played in a very chipper, upbeat 3/4 tempo (or possibly 3/8-I haven't seen the score), Dorff manages to move the music into occasionally further harmonic changes than one might ordinarily expect. This kind of movement keeps the music sounding fresh in addition to being delightful, while the following movement, titled "Winter Prayer," has a kind of feeling that one associates with the Paul Winter Consort (yet another group whose music is far more complex than they are usually given credit for). Small wonder that the entire CD is named after this work! The Three Romances is very light fare, designed to enchant rather than stimulate. Dorff explains that the first piece felt lyrical and "full of a sighing motif," while the second was inspired by the style of Antonio Carlos Jobim. Dorff's arrangements of four of Bach's Two-Part Inventions are more in the nature of a reworking of these keyboard works for two winds, to which Scott and Garrison, who generally perform as The Scott/Garrison Duo, add their own embellishments as they feel them. The Andante and Variations is the earliest of Dorff's compositions heard here, written when he was only 19 as a birthday present for flautist Sharon Ostow Rousmaniere. It's evident from this piece that Dorff's style was already fairly well formulated at a young age; the music owes something to the contrapuntal style of baroque composers, but is already in the process of becoming something different. The Three Little Waltzes is, again, fairly light and airy music, described by the composer as "a quirky set of surprises" written for flautist Cindy Anne Broz, but I was much more captivated by his delightful Two Cats, where much of the quirkiness one heard in Perennials returns. The recital ends with the Pastorale, dedicated to a Philadelphia restaurant named Frög where University of Pennsylvania music students often intermixed classical works with American classic pop tunes of the 1930s and '40s. As could be expected, the music constantly shifts between a classical and a classical-pop orientation in terms of thematic material and development, with both the pianist and clarinetist attempting to stretch the music out into chamber jazz-like realms. Although it doesn't really swing and is not improvised, it is still a wonderful merging of the two kinds of music. I found this disc to be a refreshing, light but not insubstantial mood-lifter for those days when everything seems black, and I recommend it on that basis.